SKU: AF-VID-HB. Categories: AF-Resources, Videos. Improve your Flow with hand balancing practice! Hand Balancing for the Bodyweight Athlete, by Animal Flow creator Mike Fitch, provides a progressive program designed to help you master advanced hand balancing disciplines regardless of your current skill level. The key to handstand push-ups, single-arm handstands, and planche training is to start at the beginning. This video takes you through each step allowing you to work at your own pace and progress as your ability improves. Includes 5 chapters providing more than 1 hour 45 minutes of instructional content. Chapters include: Warm-Ups; Gymnastics Style; Breakdancing; Parallel Bars; and Parallettes. Video links provided for immediate download; optional DVDs also available. The video also includes 2 free bonus videos created by Gold Medal Bodies exclusively for customers who purchase this video! Improve your Flow with hand balancing practice! 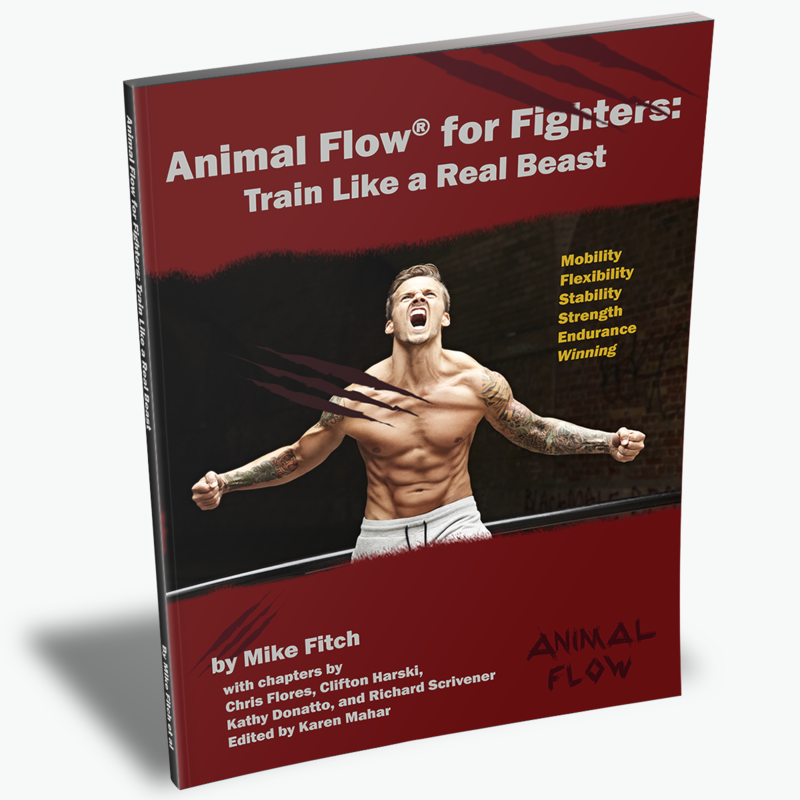 Hand Balancing for the Bodyweight Athlete by Animal Flow creator Mike Fitch, provides a progressive program designed to help you master advanced hand balancing disciplines regardless of your current skill level. Are you ready to challenge gravity? Hand balancing moves are an incredible display of strength, skill, and body mastery, and YOU can master the advanced discipline. 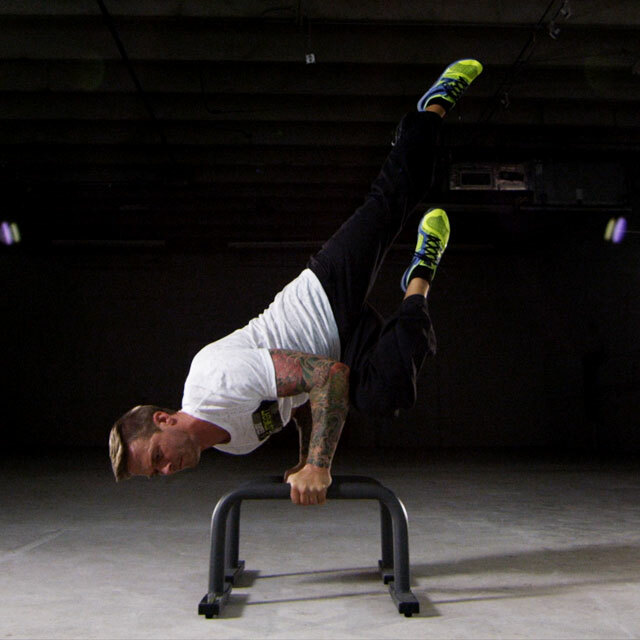 The key to handstand push-ups, single-arm handstands, and planche training is to start at the beginning. This video takes you through each step allowing you to work at your own pace and progress as your ability improves. Five chapters providing more than 1 hour 45 minutes of instructional content. Includes two free bonus videos created by Gold Medal Bodies exclusively for customers who purchase this video! Available for immediate download. Gymnastics: Build your foundation by progressing through the whole series, starting the most regressed Floor Pike Push-Ups, moving on to Wall-Assisted techniques, and working up to Freestanding Handstand Push-Ups. You’ll also learn the basics of safety, spotting, and conditioning. Parallettes: Get serious on the parallettes, covering both straight-arm and bent-arm moves. 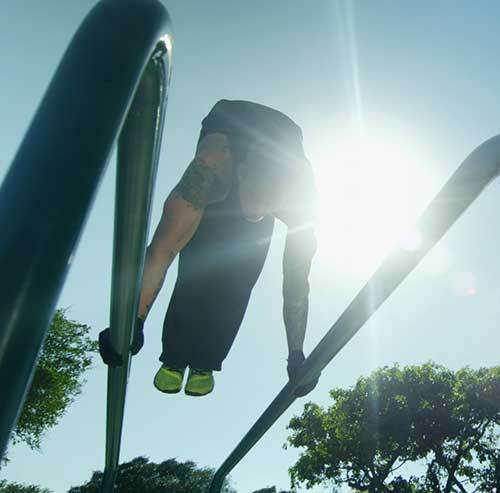 Parallel Bars: Take your skills outside onto parallel bars, learning Swings, Press-Ups and Trunk moves. How do I use the video? To begin with, we encourage you to approach Hand Balancing as a discipline. Set aside time on a regular and frequent basis to practice, and make it a point to stay dedicated. Set goals and plan on making this a long-term endeavor. Consistency will be one of the most important factors in your success! Feel free to skip around to check out the different sections, but keep in mind that the video is designed to start at a very foundational level that’s essential for proper progression in each discipline. You may think you already know how to do a Pike Push-Up, but give it a watch again anyway – you may pick up some new trick or technique that can really enhance your base for further progressions. 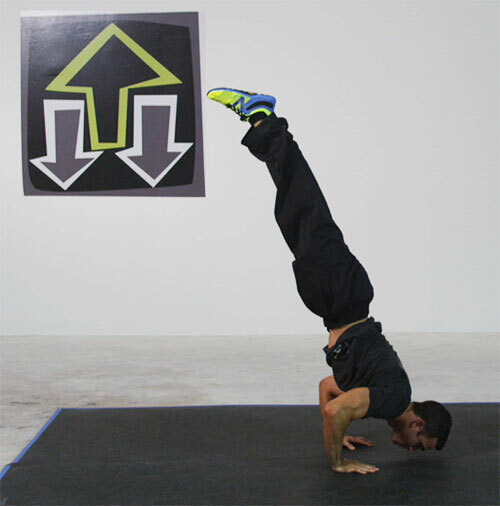 Your Hand Balance training should be an addition to your regular workout routine. Either perform your HB work at a different time of day than your resistance training, or if you choose to do it in the same workout, just train your balance work FIRST. You won’t find a lot of sets and reps schemes in this video. The focus is on your body’s own performance feedback. If your form breaks down, you stop! On conditioning exercises, try to increase reps with perfect form. On static exercises, try to increase time. Everyone will complete the full five chapters at a very different pace. Make it your goal to get through them all with perfect form, rather than within a set time limit. Is this a follow-along workout? This is not a follow-along workout where you would do the same thing every day. Instead, the video provides detailed instructions on how to properly perform each of the moves, which you will progress through at your own pace. (See the question above about How to Use the Video). Can I watch it on my iPad, iPhone, Android, or other smart phone? Yes, you can watch the videos on any device. You can download the videos and import them to your device, or you can stream them on-line. Note that if you want to download the videos to watch later on your iPad or iPhone, you will need to first download to a computer, import the files into your iTunes library, and then synch your device. The files will then appear in your library. You won't be able to download the videos directly to your device. How is the video provided? You can download videos, and purchase the additional DVD if you want the hard copy. The program is broken into five chapters. For the download files, each chapter is a separate video. You will be provided with the links to download your video immediately after your payment is confirmed. File formats include Quicktime files (HD .mov or SD .mov) and MP4s. You'll receive the links in your confirmation email, as well as on your Account page. You will need to download your video within 72 HOURS. After that time, these download links will expire and you will not have access to the video. If for some reason you are unable to download the video in that time, please contact us at customerservice@globalbodyweighttraining.com. If you purchase the DVD, each chapter also contains a sub-chapter menu that lets you jump to the specific move you want to work on. You will also be provided with immediate access to the eDownloads. DVDs ship via USPS within 1-4 business days after payment confirmation. See Terms of Service & Shipping for more information. The videos are not available for streaming on-line at this time. (We may put them on-line in the future). What fitness and/or skills levels is this for? 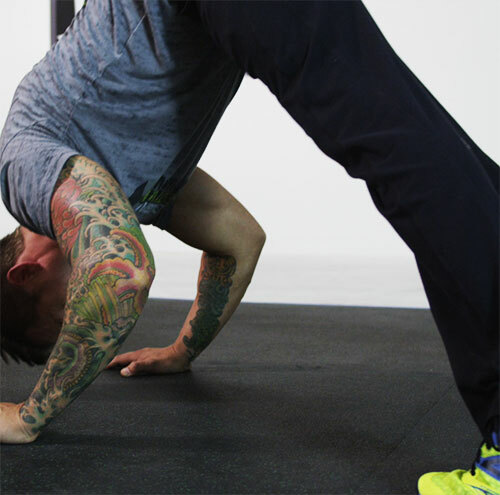 The Hand Balancing for the Bodyweight Athlete video is a progressive program that starts from the very beginning at the most regressed exercise. After all, nobody starts out doing Handstand Push-Ups! You'll move through the video at your own pace, incorporating these skills-building exercises into your existing fitness routine at your own level. 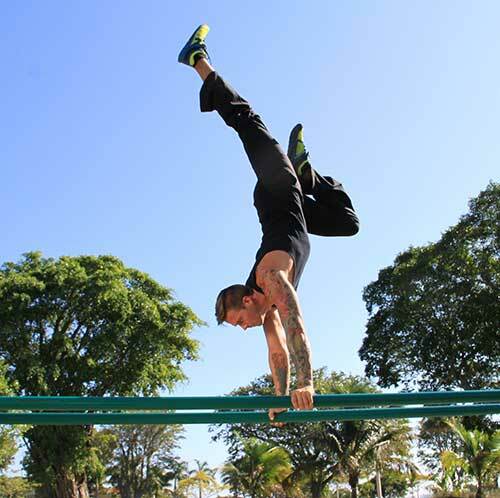 If you already have some hand balancing experience and are in pretty good shape, you may be able to go through the initial exercises very quickly, and get right into the more advanced practice. If you are totally new to this, you may want to spend more time at the beginning building your skill and strength. But whether you are an experienced gymnast or a total beginner, you'll find a place to start with this video. Your progress will depend on how much time you put into your practice. We also note that this is a bodyweight training program, and that means you'll be carrying your own bodyweight with the moves. This can make it a little more difficult for people who are heavier or have greater body mass. That doesn't mean you can't do it, but it may take some time to build up to the more difficult moves. As with any fitness program, you should check with your doctor if you have any health issues or injuries. I just want the DVD. Do I have to buy the downloads as well? When you buy the DVD, you are paying for the cost of the video itself, plus the additional cost of producing and shipping the hard copy DVD. We include the downloads with the DVD in case you want them, but you do not need to download anything if you don't want to. So if you want just the DVD, you would still need to purchase the full DVD option, and then just ignore the download links. If you aren’t satisfied with the video, we will refund your money for up to 30 days. You must return the DVD to receive a refund on that portion of your purchase.